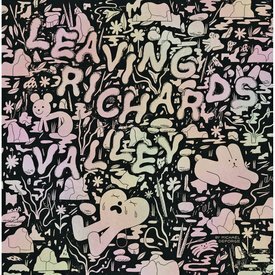 Leaving Richard's Valley collects all 475 installments of Michael DeForge's Instagram serial in a chunky, square, mirror-chrome-finished hardcover volume. Leaving is an epic comics allegory that puts us in the mind of Anders Nilsen’s epic comics allegory, Big Questions – but only up to a point. While both are lengthy meditations on a quest for meaning in life, and both involve a cast of sentient (and chatty!) animals as well as humans, and both take place primarily outdoors, in natural settings, there the similarities end. Intriguingly, it is the shift in periodical comics delivery that is, at least in part, responsible for, at least some of, the differences*. When Big Questions was first created, the best available approach to serialization was in a series of individual comics, of which there were 15 (although the first two were more or less warm ups and not directly related to the narrative, and were collected only as the bonus section of the hardcover edition). 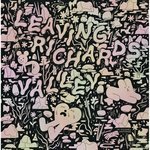 When DeForge set out on his journey of creation for Leaving Richard’s Valley, roughly a decade and a half later, he decided to serialize it as a series of daily Instagram posts, thus the square format of this book. The posts/pages are primarily composed of four square panels, with regularly interspersed single-panel, full-page splashes. For this hardcover edition, these posts have been “remastered” for print, to interesting effect. DeForge is always up for a formal challenge, and serializing a lengthy graphic novel on Instagram was certainly a challenge! With Leaving Richard’s Valley, DeForge has blazed yet another trail through the wilderness of comics. And, of course, the focus and concerns of Leaving Richard’s Valley are entirely DeForge’s, having only nominal overlap with Nilsen’s in Big Questions. DeForge here confronts – and ultimately demolishes – conceptions and perceptions of the independence of individual identity, demonstrating that all identities are interdependent and contain underlying family (parent/child/sibling/etc.) dynamics and that these dynamics will continually reassert themselves in any given situation; there is no escaping them. Amongst these, there is the obvious, special focus on the tendency, in patriarchal societies, to revert to reliance on a paternal / “Big Brother” figure, embodied here in the titular Richard. But, while DeForge asserts that there is no such thing as a self-contained individual identity that exists in isolation, he additionally asserts that no identities are permanently fixed, that while each of us posses physical, mental and psychological characteristics that are to varying degrees fixed, as our relationships shift and morph, so can – and will – our identities. However, in our current consumer society, the variables in our identities tend to be sourced from the media and the marketplace, and as such are often designed with consumer exploitation in mind, engendering imbalanced power relationships and leading to the secondary, parallel theme of the work, namely, the difficulties, if not the outright impossibility, of attaining/achieving/embodying authenticity in our contemporary society, as currently constituted in a world of appearances largely derived from profit oriented enterprises. In other words, there's plenty to chew on here.